Morris Roofing Solutions, Inc. is a diversified, national company focused on providing superb results to our customers through expert workmanship. We allocate resources carefully to our businesses so that we can obtain savings for our customers. We strive to consistently grow this business by increasing market share, improving product installation, and targeting new markets with expanded customer base. We believe you have to differentiate with value or die by price. 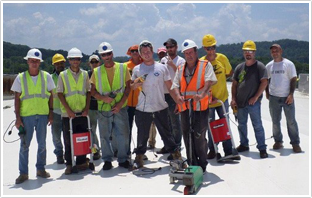 Our crews are trained year-round in the latest techniques by the manufacturers, by national roofing organizations, and through intensive in-house programs. Proper training enables us to "do it right the first time," saving our customers time and money. We do not use sub-contract crews, as many companies do, but perform all our work with our own employees, many of whom have been with the company for years. We have a written safety program, are a drug-free workplace, and have mandatory safety training and meetings. Every employee who drives a company vehicle must not only have a valid driver's license, but must also pass a background check and DMV check, as well as an insurance company pre-qualification. This has resulted in a very good safety record and an extremely low worker's compensation mod rate for the last ten years. An insurance certificate is available on request to our clients and prospective clients. We have a $2 million limit on our commercial general liability policy and our commercial auto policy, as well as an additional $4 million worth of coverage in our excess umbrella policy. These are only available to commercial roofing contractors with very good histories of successful operations. Bonded and Insured for your protection. Contact us in Coventry, Rhode Island or Sarasota, Florida, to discover the ideal roofing system for your building.